Okay, first the give-away. My dear sweet friend Jenni is having a Because I'm Me give-away on her blog. So go enter. And then come on back. I'll wait, I promise. Back so soon? Did you check out the rest of her fun blog? She's got a terrific sense of humor, a witty writing style, and beautiful children (12 of them and a grandchild!) ... well worth reading. My eldest daughter is heading to Honduras this week. She'll be flying down with a couple of other kids and then they, along with a few other folks, will be sailing a boat home. Yes, I'm jealous. Very jealous. Very, very jealous. C. asked for a large bag to carry on the plane with her as a purse, and then to use for notebooks, textbooks, and "purse stuff" once school begins again in the fall. And then she said the dreaded "make whatever you want". I had no idea what that was going to be, because while she says "make whatever you want" she means "Make me exactly what I want or I'll never use it because I'm a teenaged girl and finicky. Oh, and I'm fickle too ... just because I loved it yesterday doesn't mean I'll think it's cool tomorrow". We've been down this road before, and while it usually turns out well, I just never know. 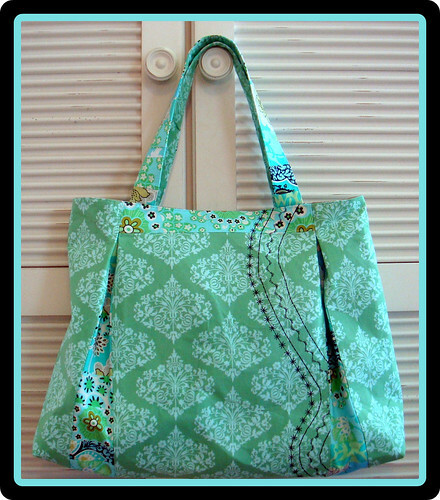 Not too long ago I made C. a bag using the pattern and directions for the Pleated Beauty Bag from Bend the Rules Sewing by Amy Karol. She uses the purse so that seemed to be a safe direction to go in. I asked if I could make that pattern again and she said yes, as long as it was bigger. Easy enough. I had received a bunch of blue/green fat quarters a while ago and thought this would be a perfect opportunity to use them and wanted to do some sort of patchwork for the bag. I decided to do the patchwork in the pleats and on the straps, though it's more just strips than patchwork. 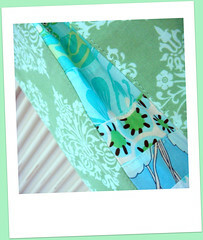 After I created the strips I looked for a fabric for the main body of the bag. 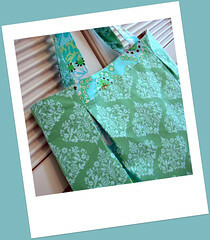 The green/blue for the main bag is an Amy Butler print that happened to be a perfect match. I love it. 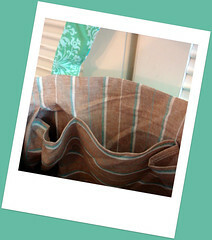 The lining is a linen-look tan with blueish green stripes. 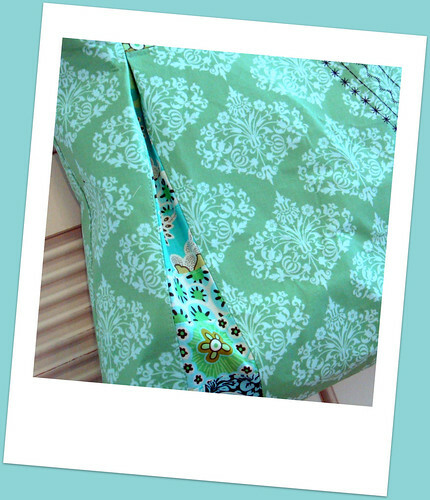 There is a strip of contrasting fabric at the top of both the front and back middle sections. That's just a little bit of artistic flair (or I just cut the body pieces too small and had to compensate somehow ... shhh ...). I added about an inch in width and length to the bag. It's big. Very big. I used a fusible heavy interfacing to give the purse more form and defined shape. 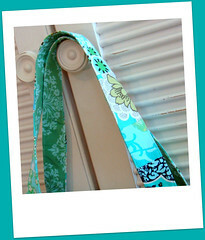 I also used the heavy interfacing on the straps. Inside the bag are lots of pockets, three on one side and two on the other. C. has a lot of "stuff" so the pockets may help her to stay a little bit organized. I added the free-form strips of stitching on the front side and I wish I hadn't. I really don't like it at all. The bag is just amazing! What teenage girl wouldn't love it? Well done!